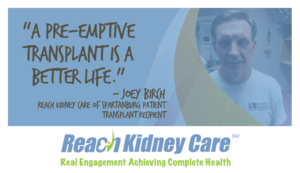 When Joey Birch found out he had inherited Polycystic Kidney Disease (PKD) from his father, one of the most common, life threatening genetic diseases affecting thousands of Americans every year, he was determined to keep his kidney function stable for as long as possible. After watching his father dialyze for years, Joey knew he did not want to end up “in the chair.” Yet, Joey had to fight to keep his kidneys healthy. His cancer diagnosis followed by chemotherapy coupled with PKD was all vying for his kidney function. “For 10 years after my cancer went into remission I had no problem. But then, around 2012, my kidney function dropped to about 10-percent,” he said. That’s when his nephrologist referred him to Reach Kidney Care of Spartanburg. Joey knew he was teetering on the precipice of dialysis. His Reach Kidney Care team presented a new idea to him: delay and prevent the need for dialysis, if possible. However, be prepared to start dialysis if needed. After meeting with the Reach Kidney Care team, his wife of twenty years, Paige, was tested to see if she could be a potential kidney match. It turned out that the woman he married was a perfect match in more ways than one! On December 5, 2013, Paige was able to become Joey’s living organ donor. Joey has overcome many obstacles along his health journey. In his lifetime, he’s sent cancer into remission, walked again after a motorcycle accident required an amputation of his left foot, and in 2013, successfully prevented the need for dialysis by receiving a pre-emptive kidney transplant. Throughout all of these trials, Joey is thankful that he was able to remain self-sufficient. “I’m proud to say that I’ve never had to rely on the government to take care of me or my family. Having a transplant has allowed me to work full time. I have private insurance. I make my own way,” he said. Today, Joey works full-time making custom, prosthetic limbs for fellow amputees.